Store away your clothes in confidence with this durable and beautiful dresser and mirror set. Each of the seven drawers are built with metal glide systems and built in drawer stops to ensure ease of use. For a nice classic touch, turned bun feet, clean edges, and antique pull knobs are incorporated into the design. All completed in a lovely Classic Brown finish, your bedroom is sure to stand out with poise and prestige with this dresser. The mirror features a simple rectangular frame that can virtually fit in any decor setting. 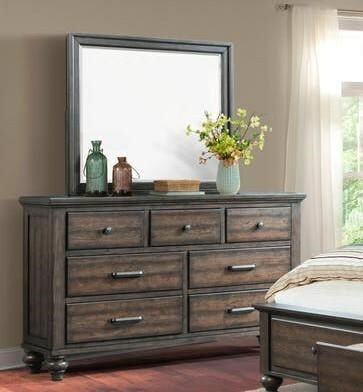 It's stunning Ash Gray finish and beveled edge makes it a wonderful fit for the dresser. The Chatham Gray Dresser & Mirror by Elements International at Great American Home Store in the Memphis, TN, Southaven, MS area. Product availability may vary. Contact us for the most current availability on this product.